I confess to being a total research junkie when it comes to my historical mysteries and I get excited by the smallest things – the surprise dedication and signature in the used book I just bought on the Ulster Crisis of 1912-1914 of the Reverend Ian Paisley (who, no matter what your politics, was a towering unionist figure throughout the 1970s and 1980s); the amazing trove of Kali books I discovered in a second hand bookstore in Omaha, Nebraska; the thrill of reading an original Baedeker guide to Palestine in the British Library….the list goes on. I confess I get a buzz from delving into history – but I also love playing the ‘what if?’ game. Fiction is, of course, all about the ‘what if’ game but with history you can have even more fun. I don’t usually go in for the major things like what if Germany won the First World War – that’s certainly interesting but a little too much like fantasy for my sake – no, I li ke to play the ‘what if’ game at a personal, character driven level about more minor historical events. 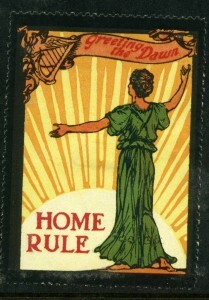 In my current WIP (the third Ursula Marlow book) I am playing it out on a major character and using the Irish Home Rule crisis of the 1910s as my backdrop. 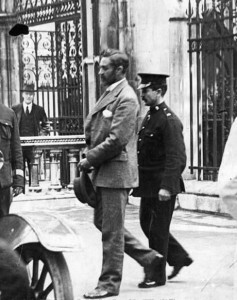 For many months I’ve been poring over the history books looking for minor references to activities that ultimately led to the hanging of Roger Casement in 1916 for trying to secure an alliance with Germany (and a supply of armaments) for an Irish uprising. I can’t say any more (and besides I don’t want to bore you senseless on a Monday morning!) lest I spoil the plot – but the key is the thrill of the ‘what if’ game. I was asked by an audience member at one of my panels at Left Coast Crime whether there were other periods of history I would like to explore, to uncover ‘the hidden history’ or perhaps even the ‘alternate’ history…I found this question a great challenge. I mean where to start?! At the time, however, I think I answered something particularly lame but for me, apart from the Edwardian period, I would love to explore and play the ‘what if’ game across the centuries. I’d love to explore the stories of the women spitfire pilots in World War II, the spiritualist movements of the early 19th century England, the phrenology and mesmerism movements in Europe, and encounters between the British and the aboriginal people in Australia in the early days of colonialization (just to name a few ideas!). I have about four proposals already whizzing around my head with some ‘what if” scenarios for my characters against these backdrops… but I’d be spoiling all the fun if I divulged anything further – so I’m going to pass on the challenge to you – is there something in history (recent or ancient) that you would like to explore, ‘rewrite’ or play the ‘what if’ game? If you could go back and be a fly on the wall – when would you chose? This entry was posted in Clare Langley-Hawthorne, historical accuracy, writing by Joe Moore. Bookmark the permalink. Funny you should bring this up Clare. Thus far all my books and stories have been of the military/action Thriller genre. But they are really just the precursor to the story I have always wanted to write. They have been the writing school about how to write the involved and deeply thought out book I really want to do. About 20 years ago I had a dream that involved my wife’s ancient ancestors in the region of modern Mongolia and Northern China. It was a very involved dream so I won’t go into details but over the years it has never left my thoughts. Instead it has become the story I want to write and the research that I most want to do. In the end it has developed into a story that runs from Israel 586 BC and continues 2000 years and travels from Pre-Celtic Ireland, through Europe, Hungary, Central Asia, Mongolia, China and Korea. It follows one blood line, and one scroll through all these places. A large portion of it is outlined already, but until I can do all the research I won’t put the details down. I’ve probably done about as much study and research as I can via the web and the library. Now, my heart’s desire is to travel to all of the places in the story if at all possible. Hopefully getting a good sale on my existing thrillers will make a trip to those places possible. If not, well, maybe I can catch job on a cargo ship or something then hitchhike … with my wife and kids … or something like that. I’ve become intrigued by the Rebecca Riots in Wales in the 1800’s, when male tenant farmers, dressed up as “Rebecca” and her “daughters,” attacked some toll gates that were widely resented by the community. That initial attack grew into a more widespread revolt against rising tolls, rents, and tithes. Cross-dressing against oppression–what could be more interesting? I’ve always been interested in WWII and I love the music from that era. One of my sisters recently found a box with some things my mother wrote when she was young. There were a few pages of the beginning of a novel written on scraps of paper, but the most fascinating thing to me was a journal entry from December 7th, 1941. I really want to write something set during this time period now. Oooh Basil, Kathryn and Joyce…these all sounds amazing. Basil – your dream sounds extraordinary and I have to confess most of my ideas come forth from dreams – wending their way through the subconscious. Kathryn, I’ll have to look up the Rebecca Riots you have me intrigued and Joyce I too am drawn to WWII. When my grandmother died she left a ring she had worn since 1942 (not from my grandfather) and I’ve always wanted to explore this story – I have even found out who the man was who gave her the ring – A NZ spitfire ace! Too many books, too little time to write them I fear! I bet there are quite a few of us who have too many stories and not enough time to write them all.